Really nice picture. Sums him up as the nice person he was. Shaun Richards, Nanpean, Cornwall, U.K.
First up, great paintin\' Jason! There you see the typical Steve with his dearest friend! Just to let Terri and Bindi know that we are all with you always and in every way!! And I know Steve\'s watchin\' us all from up there! I pray to God to keep you two happy as always! RIP STEVY!!!! u know... this painting is very mesmerizing. that... just pretty much described Steve in EVERY WORD. the way hes holding that croc. with passion, but with respect as well. i d love to get a copy of this painting. as a "silent reminder" of who we lost. 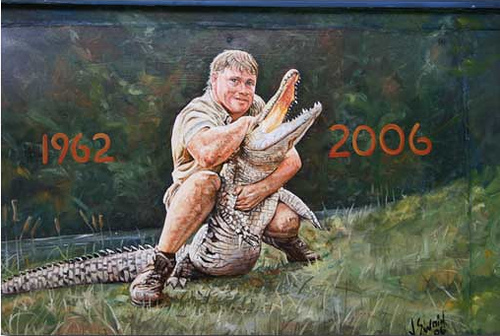 A legend... but passed on by Terri, Bindi, and Robert and the entire crew at Australia Zoo. My heart's with u guys. a perfect rainting for a perfect person!!!!!! !